Making time-lapse videos is fun. They exaggerate the passing of time and reveal a whole different view of the world. 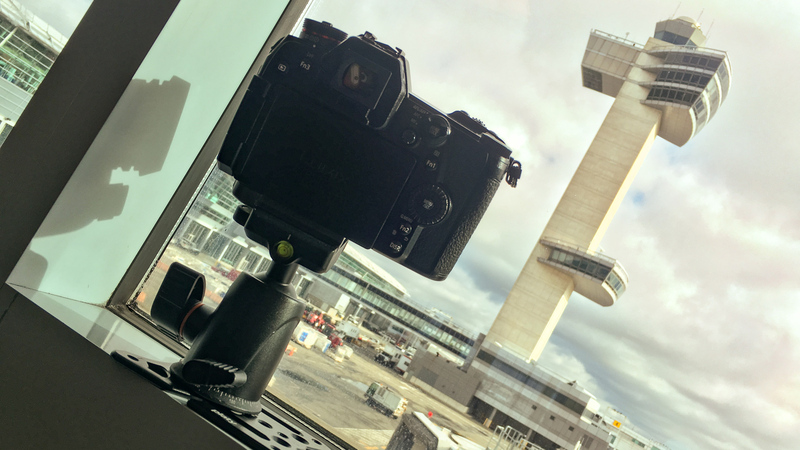 I carry my Platypod Ultra everywhere so I’m always ready to set my camera to time-lapse mode and record traffic or clouds or airport work or a wildfire. I was making one the other day while awaiting my flight home from PhotoPlus Expo. You must use manual focus for time-lapse sequences. If you leave the camera in autofocus mode (as I did below) the camera will hunt for focus between frames and will probably focus at different distances. This results in a pulsing look in the timelapse. It looks like it stutters in and out. Like the time-lapse below, I’ve ruined several otherwise-good sequences by forgetting to switch to manual focus. To manually focus for time-lapse, just use autofocus to focus on an object in your frame, then switch the camera or lens to manual focus. The lens will stay focussed at that distance until you move it or, heaven forbid, bump it. Making time-lapses is not only fun. They make good stock footage, too. Use manual exposure settings, and, most importantly, switch the camera to manual focus so it doesn’t shift focus between frames. I can’t wait to see what you make. Photofocus has lots more time-lapse tips. You can also enter time-lapse in the search bar at the top of this post.